© and (p) 2010 Z-BOP. All tracks written and produced by Stephen Horne. Six tracks of techno invention and pure electronic ebullience from Devon’s unsung groove master Even Steven aka Stephen Horne. Tune in to UHF for rousing oscillations of dancefloor optimism. Onward as he rolls out the skweeed funk elevations of Ramp. Pent Up is a pared down tough nut at the centre of the selection – a digital skitbit for the daring DJ. Block It Out serves as alarm call for flagging future dancefloors, urging us to forget the pain in our legs as we kick it for one more. After such 4/4 talent on show The Y Factor changes tack to give hip hop a dressing down, refitting it Horne style. Fiscal Glitches completes the package with a tour-de-force of deeply affecting rhythmic electronics sure to get those hackles up! This is true originality from a singular voice in electronic music. "It's been a long time since we last heard from Even Steven. 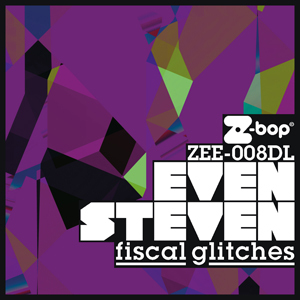 For the 'Fiscal Glitches EP' he augments his style with swirling electro-disco synths on 'UHF', while 'Ramp' jacks on a screwy electro vibe, 'Pent Up' lurches on ruffer electrostep swing and the title track reminds of Black Dog or older FSOL." "Another masterpiece from Z-Bop! "Pent Up" is my fav: dark and funky as I like. But all the tracks are amazing. Well done!" "You wouldn't think looking at him . . . but he's the biggest ghetto pimp bad boy in Devon." "This Even Steven ep is great, really different sounds and rhythms. Refreshing."